Trick by Ltd. Tenyo Co.
$23.95 In stock. Order in the next 5 hours, 6 minutes and it will go out today! In stock. Order in the next 5 hours, 6 minutes and it will go out today! Magic with chocolate!? Yes, please! Your eyes will pop when you first hold the enclosed props in your hand. The precision gimmicks and unique principle is stunning, even to seasoned magicians. You will be able to visually make the corner of a chocolate bar disappear and reappear on a different colored chocolate bar! At the finish, both chocolate bars completely restore to their unbroken state. The precision props are molded to look identical to real chocolate bars. If you love chocolate, magic, or both... this trick is deliciously deceptive! 1. Rub your hand over a chocolate bar, and the corner magically vanishes! It is not hidden behind the chocolate bar. Instead, the vanished corner reappears attached to a bar of white chocolate! 2. 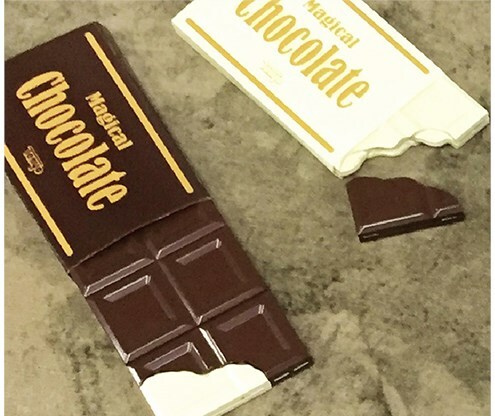 Reattach the corner to the milk chocolate bar, and... as if by magic... the corner completely restores to the bar with no cracks or seams! 3. 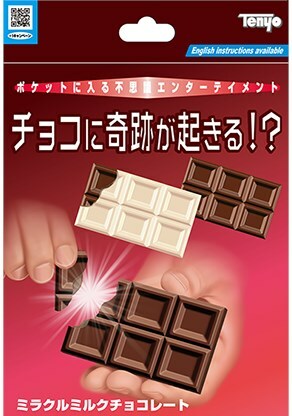 Gently rub the white chocolate bar, and it also restores to a full bar of chocolate! Caution: The enclosed props are not edible. Do not attempt to eat or put into your mouth, as the enclosed props are a choking hazard. Craig asks: Does this come with instructions and are they in English? 1. Vanishing Inc. Magic responds: Indeed - English written instructions are included.